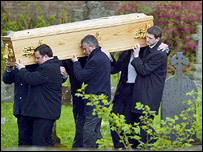 The funeral has taken place of banker Alistair Wilson, who was shot dead on the doorstep of his home in Nairn. 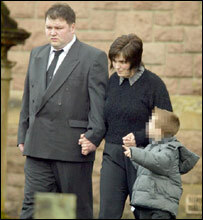 Mr Wilson, 30, who was married with two young sons, was gunned down on Sunday, 28 November last year. 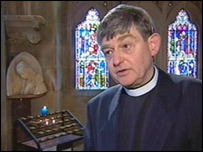 Mr Wilson's funeral service was held at St Andrew's Episcopal Church in Fort William. A private memorial service took place in Nairn in December. Mystery still surrounds the killing of the businessman, which shocked the Highland community. His widow Veronica, 33, said her husband appeared untroubled when a man arrived at the front door of their house in Crescent Road on the Sunday evening and asked for him. He was then shot by the man, who fled the scene. About 250 people attended the service at St Andrew's Episcopal Church, which was led by the Very Reverend Norman MacCallum. He said: "In the service Veronica quoted a little poem which ends with the words that nothing can take away from the life that they shared together. "Really that's what we are thinking about in the service, we are thanking God for Alistair's life, short though it was, but nothing can take that away from the family." Mr Wilson's childhood friend and best man at his wedding, Craig Wilson, who recalled happy memories of their time growing up in Beith, Ayrshire. He joked that even after Alistair went to university in Stirling, they remained close and would meet for a "dinner" of chips, fried rice and curry sauce, finished off with a dessert of two pints of lager. "Alistair had a heart of gold," he said. "I have always enjoyed his company, his sense of humour, his honesty and his sincerity. "He was a gentleman and a friend you could trust and rely on, the type of friend you were proud to have." In December, officers announced that a handgun which was found in a drain near the scene was the murder weapon. They also carried out DNA tests on people who were known to be in the area at the time and have been checking Mr Wilson's contacts as far back as his student days. Mrs Wilson has appealed for the public's help in tracking down the murderer and said her husband's death had left the family bewildered and distraught. Mr Wilson's body had been retained as evidence by investigators but last week it was announced that it would be released. Chief Inspector Peter MacPhee, who has been leading the murder investigation, said he hoped that the release of the body would help the family in their grieving process.